Homemade Pumpkin Puree | Cooking Ripe! I already told you about my affinity for orange food when I wrote the the carrot soup post, so you had to know I would be talking about pumpkins – a lot! If you’re a Pinterest fan like me, you know that pumpkin-anything recipes are the most pinned recipes right now, so it’s only fitting we make some homemade pumpkin puree to get ready for all those orange recipes. Along with my mysterious cantaloupe plants out in the garden, I also ended up with a very nice crop of pie (sweet) pumpkins. I never thought to grow pumpkins before. After all, how many jack-o-lanterns does one need a year? But, I knew that the pumpkins that I accidentally grew were pie pumpkins because that was the only kind I had thrown out there during my lazy composting last winter. So, it dawned on me that since I use a lot of pumpkin puree for Fall recipes and for my homemade doggie treats (Yeah, I’m that kind of dog owner. 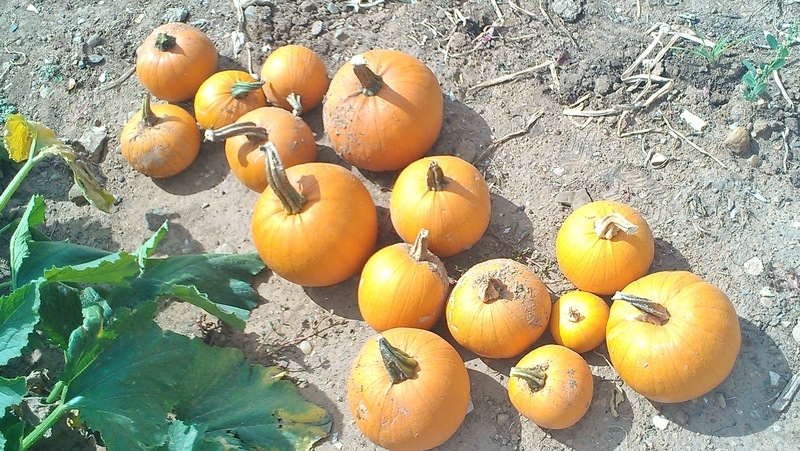 Yeah, I’ll share the recipe in a future post), I should be really happy to have my own crop of sweet pumpkins. That said, I always thought starting with an actual pumpkin would be complicated and laborious work. Turns out I was wrong. It’s pretty darn simple and it tastes SO much better than canned. AND, a cup of pumpkin is only 41 calories! 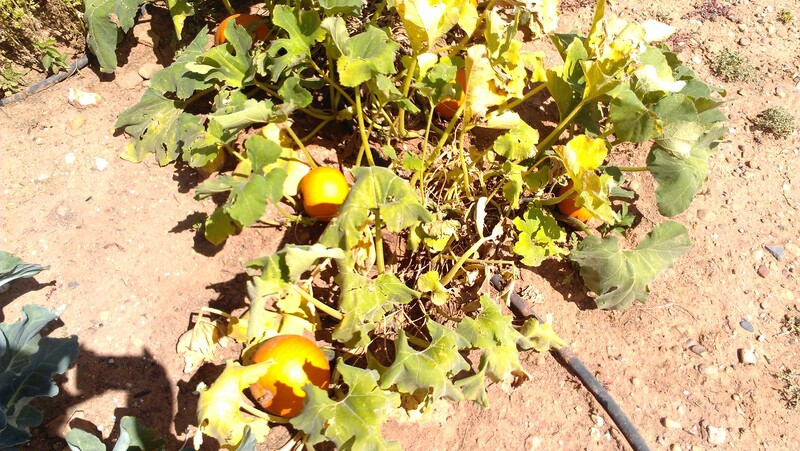 While I know most people don’t have a personal crop of pie pumpkins in their backyard, we can all take advantage of the plethora of little pumpkins that are appearing in big bins at the market and farmers markets at this time of year. They cost almost nothing and they are so easy to work with. I used a couple of resources to learn how to make puree: Simple Bites and Elana’s Pantry. First, start with the little pie pumpkins – they are the baby-sized ones, not the big carving kind (which don’t taste as yummy) or the super-mini kind. You can use them for decor around the house during Halloween season, then make puree and all kinds of pumpkin yummies out of them. 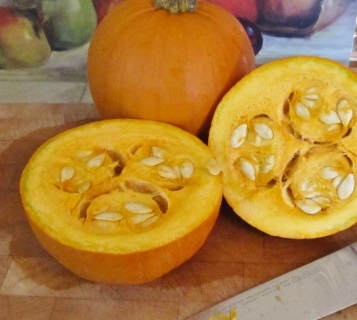 Cut the stem off, then slice the pumpkins open, horizontally. Scoop out the seeds and stringy pulp, reserving for later. 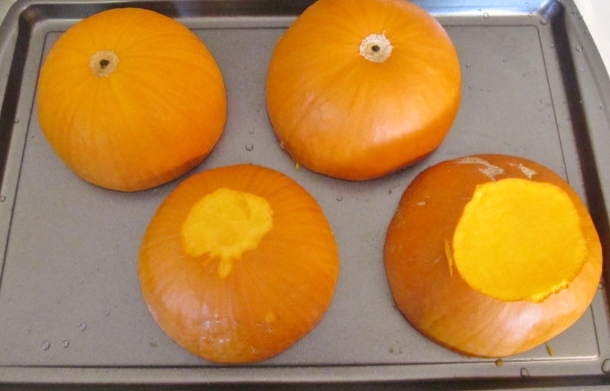 Place pumpkin halves cut-side down on a rimmed baking sheet. Two pumpkins fit on one of my baking sheets. Bake at 350 degrees for about 45-60 minutes, depending on size. 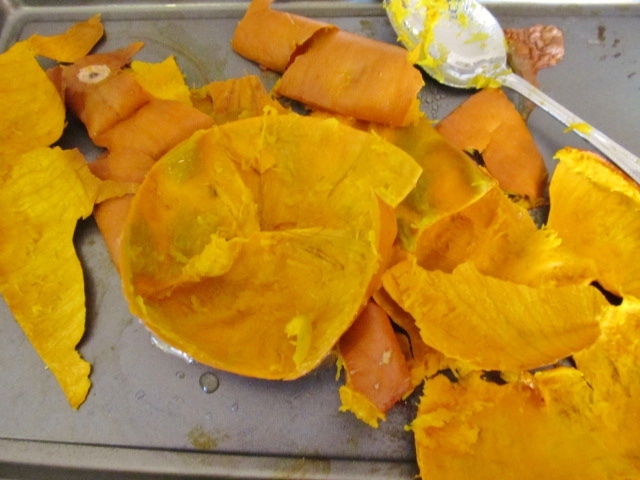 You know they are done when you can insert a fork into the outside of the pumpkin easily and the inner flesh is quite soft, but not complete mush. 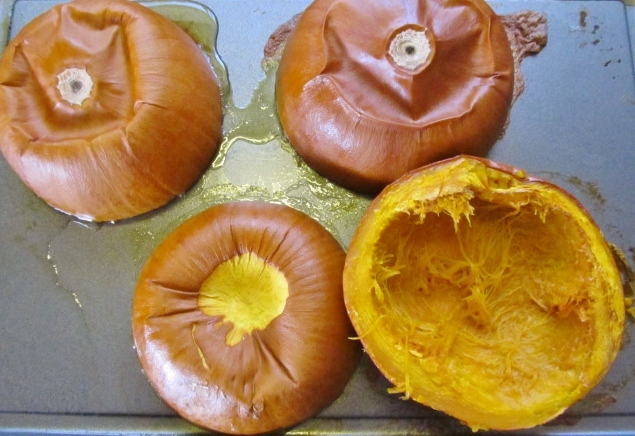 Let cool until you can handle the roasted pumpkins. Then scoop the flesh from the outer shell and place in the food processor. Puree until very smooth. Remove from food processor to a colander to drain off excess moisture. Use cheesecloth or coffee filters to line the colander so you don’t lose the precious pulp. Allow to drain for about 30 minutes. Drain in a lined colander for about 30 minutes. Once it’s drained, you can use it immediately in your favorite pumpkin recipe or you can store it in the fridge for a few days and/or freeze it for later use. My two small pumpkins yielded about 2.5 cups of puree. I used a little for a fruit tart recipe (recipe coming in a future post) and froze the rest. I used a muffin tin to freeze 1/2 cup portions, which are handy to grab and defrost as needed. BUT WAIT, there’s more! 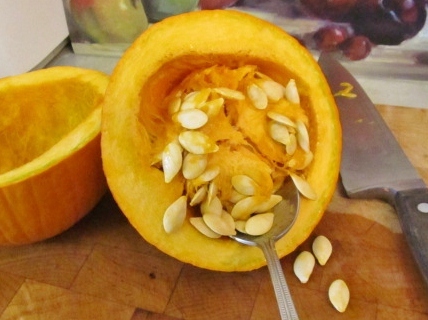 Remember the seeds and stringy pulp you scooped out of the pumpkins earlier? Separate the seeds from the pulp. Put the leftover pulp in the veggie stock freezer bag (see sidebar in this post) and rinse and dry the seeds. 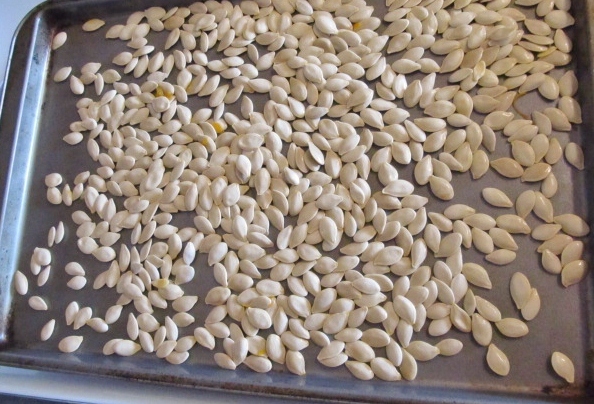 When the seeds are dry, mix with a little melted butter and salt and roast at 300 degrees for about 45 minutes. Great, healthy snack! 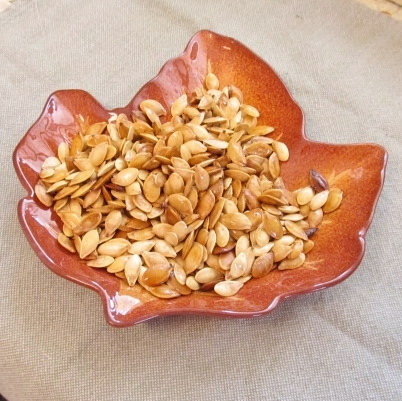 For other fun roasted pumpkin seed recipes, see my pumpkin board on Pinterest. 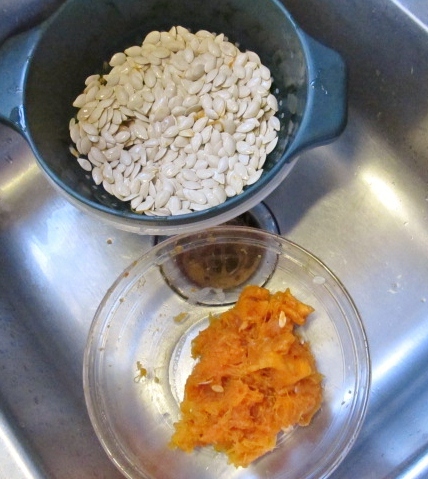 So, from two little pumpkins we have made puree for cooking, seeds for snacking and pulp for veggie stock. Some would also argue that we should reserve the liquid from the puree we drained. Ok. I didn’t, though. 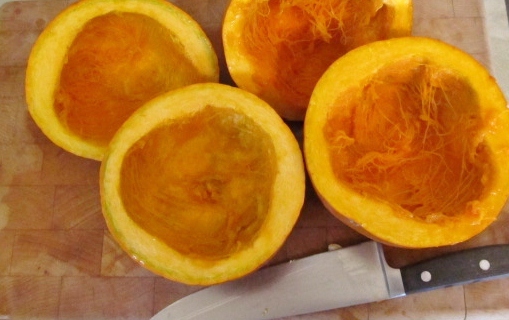 Now, what are we going to make with our pumpkin puree? EVERYTHING! My personal fav is the soft pumpkin chocolate chip cookie, but I can’t have those very often. So, there’s also pumpkin pie (duh, right? ), pumpkin waffles and pancakes, pumpkin pasta, pumpkin bread, pumpkin soup, pumpkin chili, pumpkin bread and muffins, pumpkin bars, pumpkin quinoa, pumpkin lattes, pumpkin smoothies, pumpkin butter, and pumpkin granola bars…..and the list goes on and on! Here are three of my pumpkin creations: Curried Pumpkin & Bean Soup and Pumpkin & Fruit Galette and Pumpkin, Bean and Rice Burritos. I’ll show you as I go through my pumpkin pins. 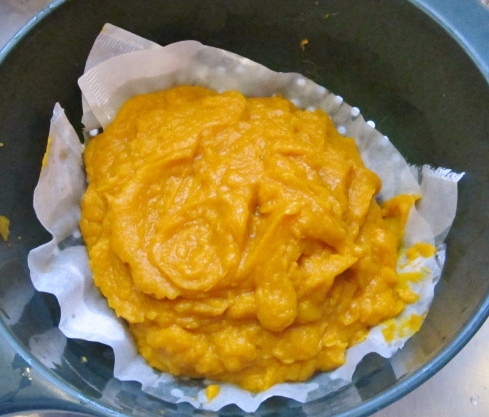 Oh, and did you know that you can sub pumpkin puree for oil in many baking recipes (like you might do with applesauce)? Leave a comment with your favorite recipe using pumpkin! Categories: Cooking, Garden, Preserving, Veggies | Tags: autumn, Cooking, easy, food, freezing, Fresh, Harvest, pumpkins, puree, recipes, squash, Vegetarian | Permalink. 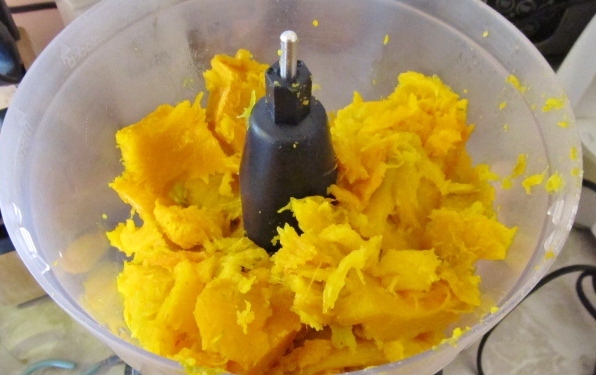 It’s great to see pumpkin puree that doesn’t come from a can! It looks delicious! I hope you make something wonderful with it. It’s really wonderful – tastes so…fresh! Don’t worry, I’ll be making lots of wonderful things. What will you make? I’ve been keeping busy cooking a lot of different things (you should check some of those out on my blog). I’ve kind of been avoiding fall stuff though for fear of admitting that it is finally fall. But, if I had that pumpkin puree, I would definitely make some pumpkin pie, pumpkin bread, pumpkin soup, and maybe even some pumpkin chocolate chip cookies. Ha! I hear ya about the end of summer. Here, it’s getting quite cold, so no more denial. Time to dive into Autumn cooking. I checked out your blog – looks great and the autumn salad is a nice nod to the changing season. Pingback: Easiest Pumpkin and Fruit Galette (Tart) « Cooking Ripe! This is probably easier than how I make the puree and must try it next time. I cut it into smallish pieces and boil it. I guess that loses some goodness and it is also so hard to cut when fresh that I am afraid I will break the knife. One cut seems doable. Thanks for the suggestion. The other bonus is that it smells divine when it’s roasting. 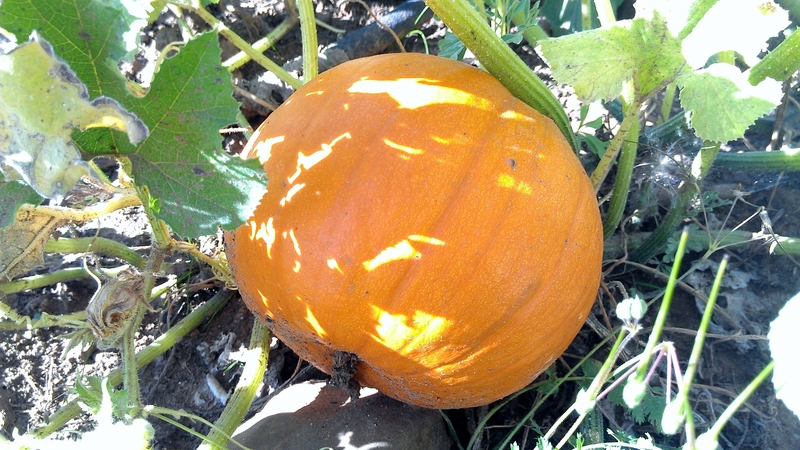 I didn’t have too much trouble with the cut – but it depends on the age of the pumpkin, I think. I came across a pumpkin bread recipe, but have no canned pumpkin. Then I remembered the pie pumpkins out on the front porch! I’m going to give this a whirl. My hubby did it 2 years ago, but he did the boiling method too. This sounds much easier, thanks! I missed this comment earlier – oops! I hope the porch pumpkins worked out nicely for your bread! Pingback: Curried Pumpkin and Bean Soup – a quick harvest meal « Cooking Ripe! JS – Let me know how it turns out! I think you’ll enjoy the richer flavor of the roasted vs. boiled pumpkin. Enjoy! Pingback: Pumpkin, Rice and Bean Burritos « Cooking Ripe! Pingback: Easy Vegetable Stock « Cooking Ripe! Pingback: Adventures in Canning Tomatoes 1.0 « Cooking Ripe! Pingback: Carrot and Sweet Potato Soup – orange you ready for some soup?? « Cooking Ripe! Pingback: Cooking Ripe! 2012 Review and 2013 Preview « Cooking Ripe!